Commonly, test automation involves automating a manual process already in place that uses a formalized testing process. I can’t decide whether it bothers me because it’s wrong, or because so many people believe the statement is true. In fact, I know the approach in some organizations is to “design” a huge list of manual tests based on written and non-written requirements, and then either try to automate those tests, or pass the tests off to another team (or company) to automate. Some tests can only be run via some sort of test automation. Some tests can only be done via human interaction. You can’t effectively think about automated testing separately from human testing. Test Design answers the question, “How are we going to test this?” The answer to that question will help you decide where automation can help (and where it won’t). 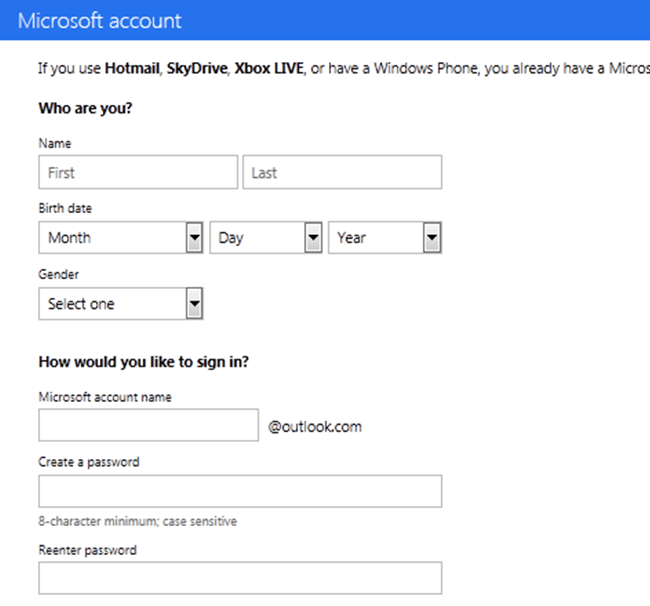 Here’s a screen shot of part of the registration form for outlook.com (disclaimer – I have no idea how this was tested). Let’s look at two different ways of answering the “How will we test this?” question. The “automator” may look at this and think the following. Oh – I’ll try that passwords with foreign characters too. Once I go through all of that, and anything else I discover, I can sign off on this form. I’ll fire off a disclaimer now, because I’ve probably pissed off both “automators”, and “humans” with the generalizations above. I know there’s overlap. My argument is that there should be more. In my contrived examples above, the “automator” is answering the question, “What can I automate?”, and the “human is answering the question, “What can I explore or discover?”. Neither is directly answering the question, “how are we going to test this?”. I could just merge the lists, but that’s not exactly right. Let’s throw away humans and coders for a minute and see if we can use a mind map to get the whole picture together. Here’s what I came up with giving myself a limit of 10 minutes. There’s likely something missing, but it’s a starting point. Now (and at no time before now), I can begin to think about where automation may help me. My goal isn’t to automate everything, it’s to automate what makes the most sense to automate. Things like submitting the form from multiple machines at once, or cycling through tables of data make sense to automate early. Other items, like checking for non-existent days or checking max length of a name are nice exploratory tasks. And then, there are ideas like foreign characters in the name, or trying RTL languages that may start as an exploratory test, but may lead to ideas for automation. The point is, and this is worth repeating so often, is that thinking of test automation and “human” testing as separate activities is one of the biggest sins I see in software testing today. It’s not only ineffective, but I think this sort of thinking is a detriment to the advancement of software testing. In my world, there are no such things as automated testing, exploratory testing, manual testing, etc. More musings and rants to follow. All sounds so simple and common sense when written like that – so how come it ends up in such a stinking mess most of the time ? Sadly, I believe this entry is correct. It is indeed “common” that folks approach test automation this way. I agree with you that this is a poor way to approach test automation, though. Thinking about relevant quality attributes often helps me discover what’s important, and when reflecting on e.g. stability the way to do it usually comes natural. The automated/exploratory/manual words surely are imperfect models, but they are often useful for communication, and as a start for learning things. Excellent points and very well stated. You continually convince me on the idea that all testing is just testing, and that there’s not much point in trying to catergorize everything to make things more “efficient”. I like the way you roll. It drives me up the wall when I’m asked for an “automation strategy” when its clear there is no test strategy to speak of, or when I’m asked to set up an “automation team” when testing – in general – is challenged. The worked example nicely illustrates the post’s main point. Please keep up your lucid, persuasive ranting and raving.